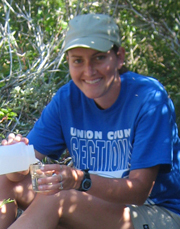 Erin Overholt has been the lab manager since 2006. She participates in the lab’s ongoing research ranging from the laboratory at Miami University to field research in Ohio reservoirs, Pocono lakes in Pennsylvania, and to alpine systems throughout the country and beyond. Specific research projects have included the sensitivity of parasites to UV and the subsequent effects on lake epidemics as well as UV attraction and avoidance in calanoid copepods. 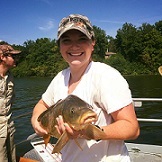 Rachel Pilla is a PhD student analyzing long-term lake temperature data from around the world in the context of climate change and seasonal changes in abiotic factors such as water transparency, lake temperature, dissolved oxygen, and watershed characteristics. Her research focuses on the ecological consequences of changes in lake thermal structure and the implications for lake ecosystems and services. Rachel is also interested in the effects of lake browning due to increased dissolved organic carbon, and the potential resulting effects on oxygen, temperature, and biota. She completed her Master’s degree in the Global Change Limnology Laboratory in 2015. Nicole Berry is a PhD student examining the role of DOM as a biotic and abiotic driver of aquatic communities. Browning, or an increase in color-absorbing compounds in the water, can impact communities through shading or by serving as a carbon and/or nutrient subsidy. Nicole is studying the ways in which these different mechanisms can facilitate the movement of invasive species or vector-borne pathogens into lakes with changing transparency and dissolved organic carbon inputs. She completed Masters degree in the Global Change Limnnology Lab in 2018. 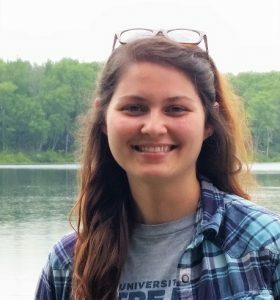 Lauren Knose, who began working on her PhD in Fall 2016, is studying the effects of climate change and changing transparency on lake phenology, mixing, and nutrient regeneration. In particular, Lauren is interested in how lake browning can affect the development of harmful algal blooms. With a Master in Public Health degree, Lauren is also curious about the public health and socioeconomic consequences of blooms on communities that rely on the lake for goods and services. Keiko Wilkins joined the lab in 2015 as an undergraduate. During the summer of 2016, as part of a Undergraduate Summer Scholar (USS) award, she studied the effects of hypoxia and anoxia on the abundance and vertical distribution of crustacean zooplankton within Lake Lacawac. Her Masters research focuses on the effects of dissolved organic matter on cladoceran survival.